Disclosure: I’m so grateful to have received a copy of Samantha Ferraro’s debut cookbook, The Weeknight Mediterranean Kitchen: 80 Authentic, Healthy Recipes Made Quick and Easy for Everyday Cooking. I hope you all enjoy this little sneak peak! A lot of people have been asking me “what’s the best thing you ate in Greece?”. A fairly easy question. But one that I haven’t been able to answer with a straightforward response. Because I just can’t seem to pick a favorite dish. 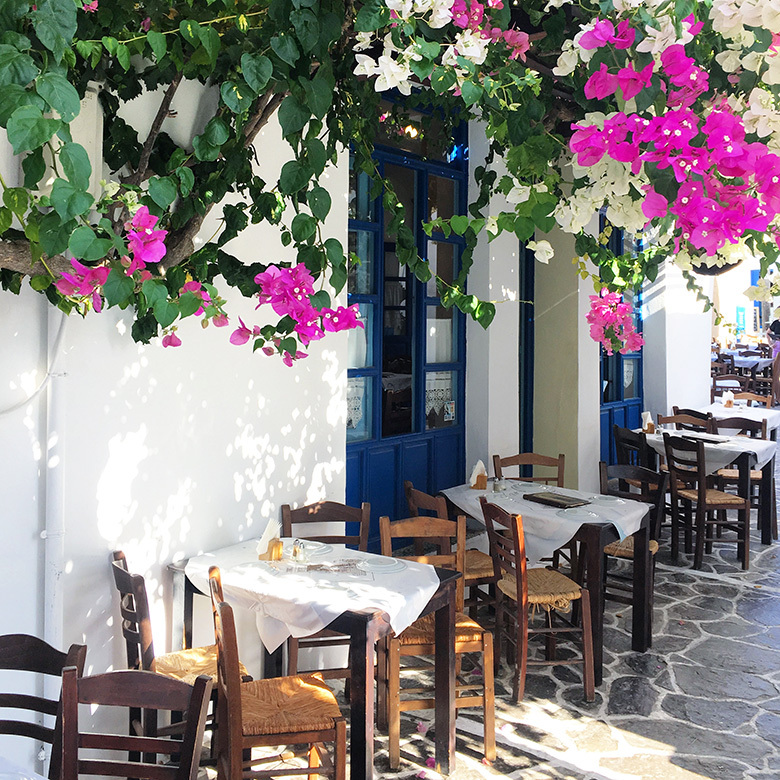 Everything that I ate in Greece was fantastic. I was actually surprised at how consistently delicious each meal was. And trust me when I tell you that I tried it ALL. Gyros, salads, moussaka, zucchini balls, baked giant beans, dolma, yogurt, phyllo dough pastries, cakes and on and on and on. I could make a list to fill this entire page. Each meal left me excited for the next. And I made every effort possible to make a mental imprint of all the dishes that I hoped to re-create once I returned stateside. 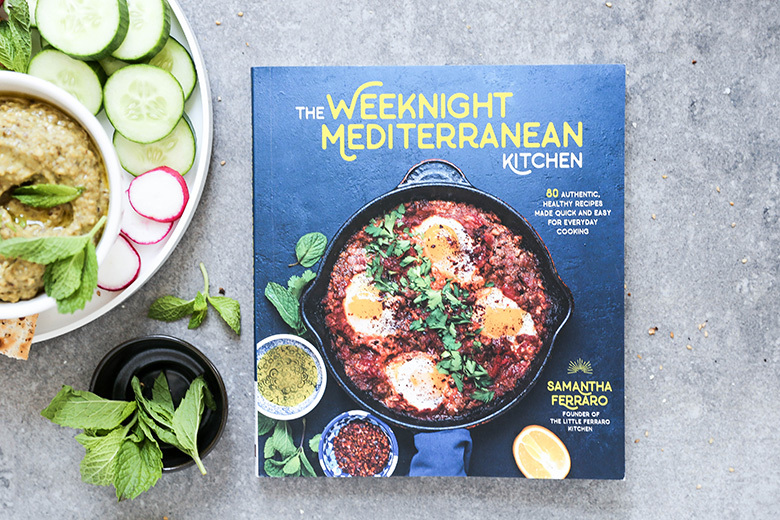 So imagine my delight when I got home to find Samantha Ferraro’s first cookbook, The Weeknight Mediterranean Kitchen: 80 Authentic, Healthy Recipes Made Quick and Easy for Everyday Cooking, waiting at my doorstep. My taste buds were literally primed for each and every recipe in her book. Given that I wanted to make ALL THE THINGS from Samantha’s cookbook, it was certainly a challenge to pick just one of her recipes to share with you all today. But my weekly trip to the farmer’s markets left me with an overabundance of eggplant, so her Persian Style Eggplant and Yogurt Dip quickly became the natural choice. Also, since getting back from Greece and having lots of “mezze style” meals there, I’ve been really jonesing for small plates and appetizers. 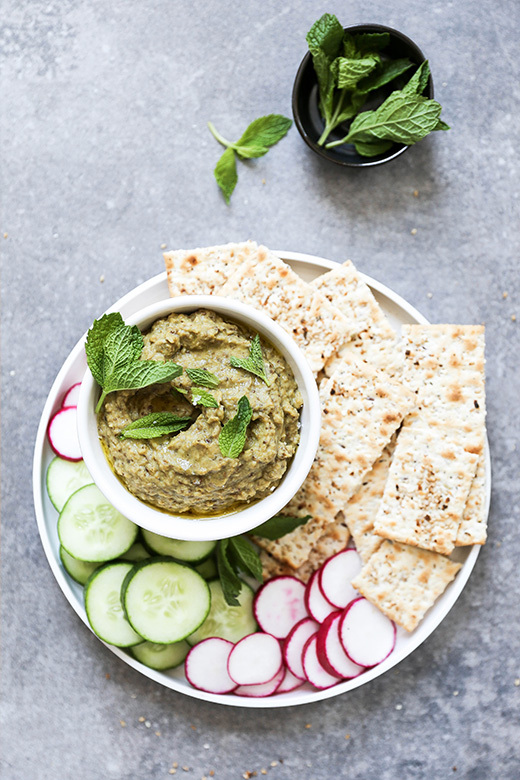 Just put a bowl of this dip in front of me with a pile of fresh vegetables and crackers and I’m one happy chick! This Persian Style Eggplant and Yogurt Dip comes together easily (and boasts a relatively short ingredient list), just like so many of the other recipes featured in The Weeknight Mediterranean Kitchen. 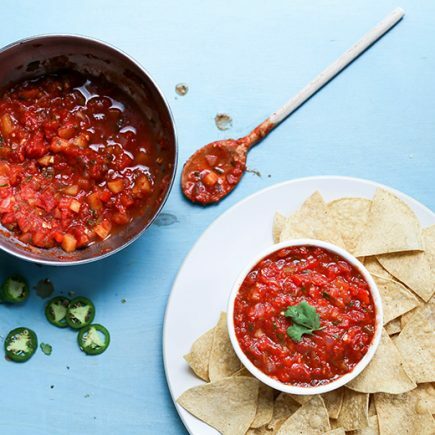 This is food you can make and eat anytime. No special occasions needed. If you’re a fan of vibrant, aromatic and EASY Mediterranean dishes, then you’ll instantly be a fan of Samantha Ferraro. Check out her blog and her cookbook. And take a vacation in your kitchen! Pre-heat your oven to 425 degrees. Line a large rimmed baking sheet with parchment paper. Use a fork to poke holes all over the surface of the eggplant. Then place the eggplant on your prepared baking sheet and roast in your pre-heated oven for 35-40 minutes. The eggplant should collapse and be slightly charred in some places. Remove the baking sheet from your oven and set it aside until the eggplant is cool enough to handle. Then cut off and remove the stem from the eggplant, slicing it in half to expose the flesh. Use a spoon to scoop out the flesh, leaving behind the skin. Add the eggplant flesh, yogurt, lemon juice, garlic, turmeric and salt to the bowl of your food processor fitted with the blade attachment. Pulse until all the ingredients are just combined, scrapping down the sides of the bowl as necessary. Taste and adjust for salt, if necessary. Transfer the dip to a bowl. 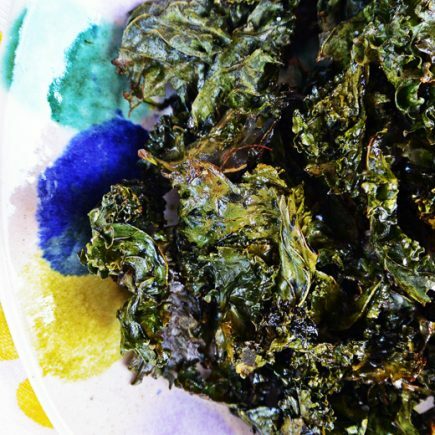 Drizzle with olive oil and garnish with fresh mint leaves, if desired. Serve with crackers, chips and fresh vegetables. This recipe has been reprinted with permission from Samantha Ferraro. 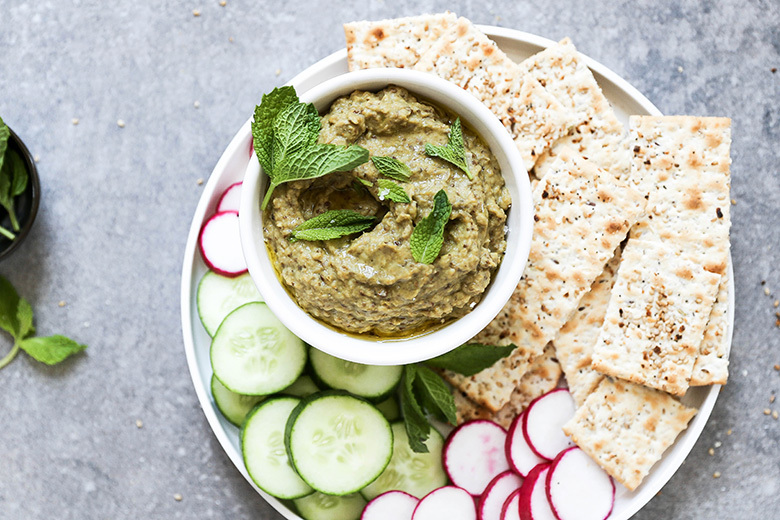 I’m ALWAYS in the mood for a good Mediterranean dip! Isn’t travel the best? Once home, I always want to experiment and try those flavors reminiscent of the trip. 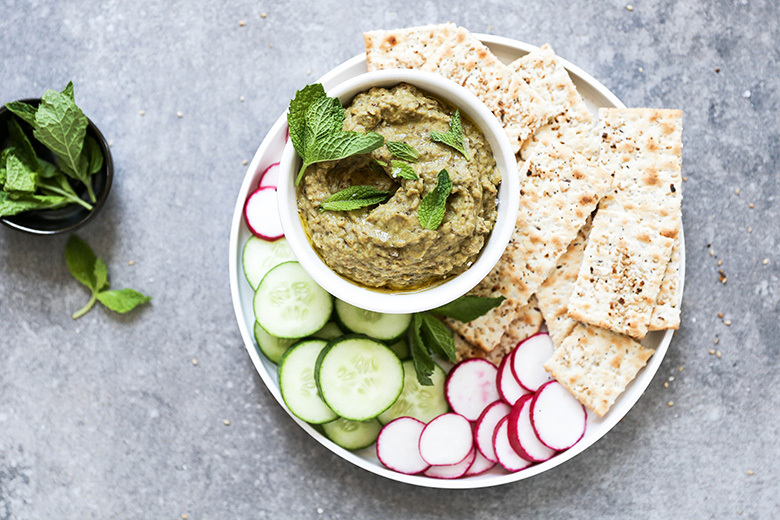 This dip looks fabulous – no doubt the eggplant is rolling in and I absolutely love it! I’ve seen Samantha’s work, but have never visited her blog – gotta go check it out. Her book looks fabulous! And I’m with you on a mezze platter… throw a bottle of wine in there and I’m SO happy! Oh there definitely will be wine! Lol! I could eat this for dinner with a glass of wine and be totally satisfied! Looks crazy delicious! Same. Just gimme all the snack foods! It’s hard to stop once you stop!